Every weekend across the United States, equestrians gather at a variety of facilities for a show or event in their favorite discipline. But beyond the trophies and ribbons, many horse lovers may not consider the importance these public and private venues have in ensuring places are available for training and competition. What is most important regardless of how they are structured and managed, every equestrian has a stake in helping ensure their future. “Without the active involvement of equestrians speaking up for these special places, and supporting them with their time, talent and treasure, these beautiful and vital competition venues may be lost forever,” notes Deb Balliet, CEO of the Equine Land Conservation Resource. In this issue of The Resource and on our website www.elcr.org, ELCR is profiling several horse parks around the country which demonstrate various organizational structures, community involvement, and efforts to ensure places are available for equine use. Horse parks spotlighted in previous editions of ELCR’s “Sustain Your Horse Parks Series”, such as Masterson Station Park in Lexington, KY, and the Foothills Equestrian Nature Center (FENCE) in Tryon, NC, serve as successful models for what many horse lovers hope will be a future equestrian venue on the West Coast. The Monterey Horse Park (MHP) in Salinas looks to preserve pristine Central California land for equine activities and community recreation alike, and will demonstrate how land conservation and equestrian sport work hand-in-hand. Although still in a pre-construction phase, ambitious plans for the park include construction of a multi-discipline equestrian facility located on approximately 210 acres of land (including 90 acres of habitat reserve) in Parker Flats, on the decommissioned military base of Fort Ord. Between 1945 and 1975, the Fort Ord Army Base housed and trained some 1.5 million troops on its lands within Monterey County. When decommissioned in 1994 and placed under the authority of the Fort Ord Reuse Authority Plan (FORA), mandates were made to allow for 25% of the site’s 28,600 acres to be used for development, while 75% would remain as permanent open space with specific provisions for establishment of a “high-quality equestrian center”. In 2000, the concept of an area horse park received a boost when San Francisco submitted a bid to host the 2012 Summer Olympic Games. The Bay Area Sports Organizing Committee (BASOC) worked with equestrian experts from around the country and recognized the value of the former Ford Ord site as a possible equestrian venue for the Olympic Games, as well as international, national and regional competitions. 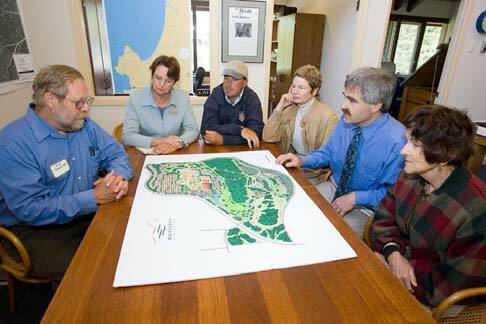 Although San Francisco was not awarded the Olympic Games, the productivity generated by the bid led to the incorporation of the Monterey Horse Park under California law in 2001 as a 501(c)3 nonprofit public benefit corporation, with a 16-person Board of Directors and bylaws patterned after BASOC’s governing documents with a commitment to environmental sustainability. While looking to host 60 shows per year in all equine disciplines, including dressage, driving, endurance, eventing, reining, show jumping, vaulting, breed shows, pony club events and others, MHP’s plans also include a Thoroughbred training center; hosting an intercollegiate equestrian team and curriculum; establishing a horse rescue/adoption center and a therapeutic riding program; camping facilities; and conducting events for youth groups. An added advantage to the Monterey Horse Park location is 15,000 acres of Bureau of Land Management (BLM) open space adjacent to the MHP property. In addition to providing opportunities for trail riders, eventing, and endurance competitors to enjoy the territory, the MHP looks to work in partnership with the BLM to build access to the acreage and educate hikers, mountain bikers, and equestrians about safety and responsible use of trails. Despite the challenges of championing a visionary project such as the Monterey Horse Park, volunteers such as Henry are devoting their time and energy to make a difference for the future of equine land, and she hopes other equestrians will do the same. “How do we get more horse people involved in missions such as this? I think that’s the million dollar question,” Henry said. “If we had an answer, we wouldn’t have a problem making things happen! I feel that if people would do something as simple as just writing a letter for their cause, it would help, and it only costs them a stamp. For more information about the Monterey Horse Park, visit their website.